Book Mind Miracles for your next conference or meeting. "Great fun…you left us scratching our heads and talking about you for days after the dinner." “…a great show. Thanks for bringing your Mind Miracles to our conference. It was exactly what we needed to make it one of the best yet." “The evening was a spectacular success and you had a lot to do with it. The attendees’ reviews have been wonderful." Bill and Esther VanGorder, award winning psychic entertainers, present Mind Miracles, a stage presentation that cleverly combines their keen insight into human nature and understanding of psychology in order that audiences can experience a mind-bending array of seemingly impossible experiments that are sure to leave you guessing and gasping long after the performance is over. In their performance for conventions, house parties, banquets and business meetings, the VanGorders read thoughts, influence audience member's decisions, and predict the future. They will even teach someone from the audience how to read minds! It is a performance of thought projection and thought reading. 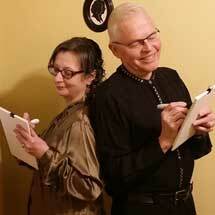 Esther & Bill VanGorder, Thought Readers have the ability to discover your inner most thoughts. You will walk away shaking your head and asking: "how did those things happen?" "Can I believe what I saw with my own eyes?" 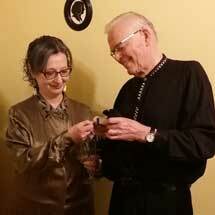 Bill and Esther VanGorder have a combined 75 years’ experience as entertainers and thought-readers. 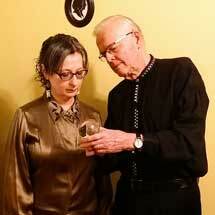 Bill is recognized as one of the area's best pendulum readers, numerologists and palm readers. He and Esther have an amazing ability to demonstrate the mystery of the pendulum. Esther and Bill VanGorder are members of the international Psychic Entertainers Association headquartered in Hartford, Connecticut USA . They have performed at its annual Meeting Of The Minds. Esther and Bill are recipients of its prestigious Bob Haines Memorial Award. Bill is also Past-President of the Psychic Entertainers Association. . Audiences will experience a mind-bending array of seemingly impossible experiments that are sure to leave you guessing and gasping long after the performance is over. Book Mind Miracles for your next convention or business meeting. Written by Bill and Esther VanGorder, Secrets of the Pendulum is a book that endeavors to explain the power of mind over matter. Available in e-book, $20 + HST. Copyright © 2016 Mind Miracles. All Rights Reserved.